This morning, for the third time since I arrived here, I woke up to the sound of Arabic voices radiating from giraffe like towers rising across the city. The unified melody is curious and unfamiliar as the language is unknown to me. Yet, the strength of devotion they emulate is becoming one of my favorite components of living in Oman. I am a white Christian woman who grew up on hymns and contemporary tunes. Still, the energy of the Muslim call to prayer is affecting me deeply and I am excited to see where the discovery of a new religion and culture will take me. Homesickness has come haunting a bit more than normal this trip. I don’t miss my bed or my cell phone data or even my carefully cared for succulent plants. I don’t miss my Netflix account or my favorite sushi place (yet). I simply miss the company of those I spend my days with and the empty spots they fill are most obvious in those times when the sun hibernates. Coincidentally, sunrise and sunset are two of the six times a day that Muslims are called to prayer. This Call to Prayer known as Adhan (“to listen”) is a purposeful act and spiritual commitment to Allah and a reminder of surrender to him. In my tradition, I also spend time in prayer but not often out loud with others. On the first day here, I woke up around 4:00am due to a severe case of jetlag. As a result, the dark, eerie essence of unfamiliarity and emptiness reminded me of my loved ones at home. I twisted and turned in my sheets thinking too much and questioning my reasons for being so far away in a foreign place. As the clock ticked away in the corner I breathed and concentrated on a spot on the ceiling hoping I’d drift back to sleep. Suddenly, a song arose out of the air and in through my windows. The morning prayer. A sound that normally would be a backdrop for an Iraqi war film nestled over my body and ironically my heart was instantly at ease. A shaky, uneasy morning was met with an easy, confident voice of prayers. It reminded me that a community of students at Hope is praying for my group and that those I am missing at home are rooting for me and wishing me well. More importantly, it confirmed that God is indeed here in this place. I am always going to wish those I love most are here on this journey with me. But, I am even more encouraged now that I will meet future loved ones here in this community of Omanis. In fact, I am confident that relationships within this new culture will change my heart and the hearts of those I share stories with at home and on this blog. I hope you will stay tuned! ¿Qué tal amigos? I hope you all are doing well and are excited to hear about the second volcanic crater I entered. 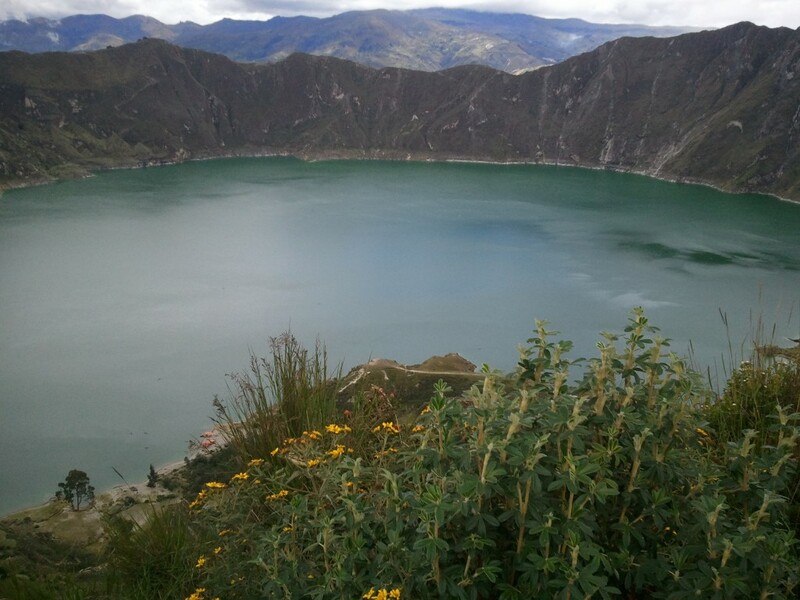 If you don’t already know, Quilotoa’s crater was formed several hundred years ago, much like Cuicocha. The lake now sits in that crater and is a popular place to canoe and observe. 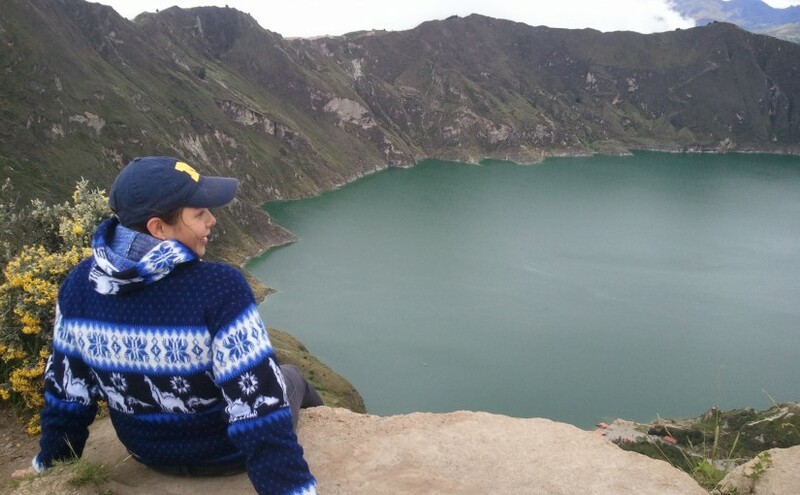 For our Andean Popular Arts class, we had a field trip to Quilotoa mostly because it’s such a beautiful lake and it’s near the art and history exhibits we planned to visit. Our first stop on this trip, however, was at an hacienda where we visited the capilla del Divino Niño de Isinche. The story of this capilla and small church begins years ago when the Spanish came to Ecuador. A statue of baby Jesus appeared on the property and people took it as a sign that a church should be built to adore God. So the church was built with a smaller building that, to this day, holds the statue of el Divino Niño. Many people visit this hacienda to ask el Divino Niño to grant miracles for them. The tiny capilla is full of photos and plaques asking for help and thanking for prayers granted. After a few minutes admiring the hacienda, we continued on our journey to Quilotoa. When we got to the town, it was cloudy and cold; the altitude made it even colder. I was not prepared for the chill, so I bought myself a blue alpaca sweater from a vendor inside the small artesanal market. I put it on, over my three layers, and went to go observe the lake with friends while looking like a fluffy, blue snowman. But I was warm! We opted for a photo shoot instead of a hike down the crater (approx. 40 minutes) and a hike back up (approx. 1.5 hours) since we had a limited time before lunch. The view was a lot more amazing in person, much more spectacular than any camera could capture. When small rays of sun would hit the lake from in between the clouds, the water would appear lime green and turquoise! ¡Simplemente espectacular! Lunch wasn’t amazing… but we ate while the rainstorm hit, so we stayed dry. 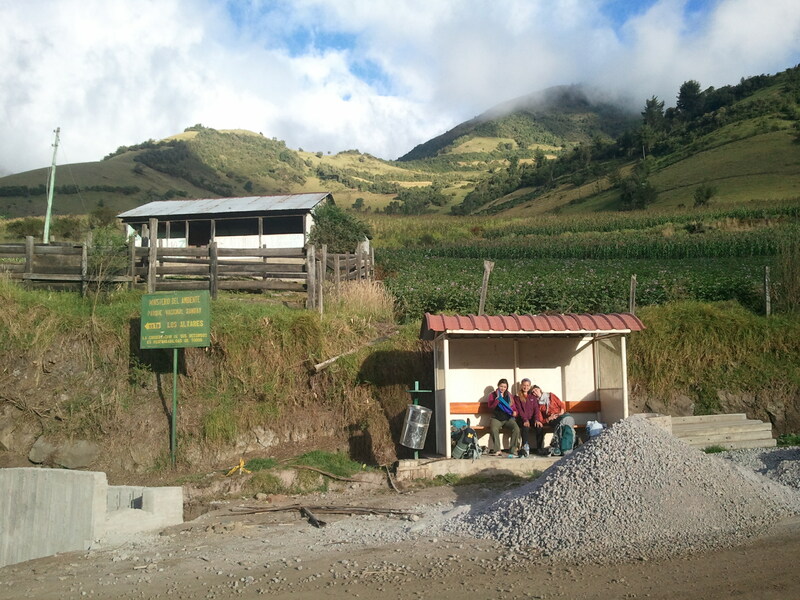 After lunch, we made it to our final destination of the field trip: a small shop and art studio outside of Quilotoa. The shop sold many colorful masks, paintings, shoes, sweaters, bracelets, etc. The paintings were by far my favorite since they were full of color and several Andean myths. The paintings shared stories that I wish someone would have explained to me, but nonetheless I was amazed. The masks were also quite chévere since they were hand-carved out of wood and painted with bright colors. I fell asleep on the 3 hour bus ride back, mostly so that I wouldn’t get car sick (but I still did). 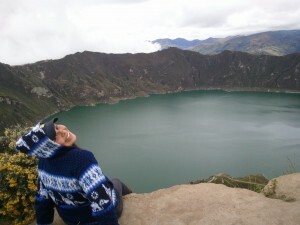 I had an amazing day learning about different aspects of Andean culture and observing the beauty of Lake Quilotoa. Plus, I got my cozy, alpaca sweater as un recuerdo excelente of the trip. ¡Hasta el próximo blog, amigos! The beginning and ending place to our hiking adventure at El Altar. Well, amigos, I finally had the opportunity to hike and camp on the top of a mountain (or close enough to the top). This weekend, three friends and I climbed El Altar which is close to the small town of Candelaria, Ecuador. 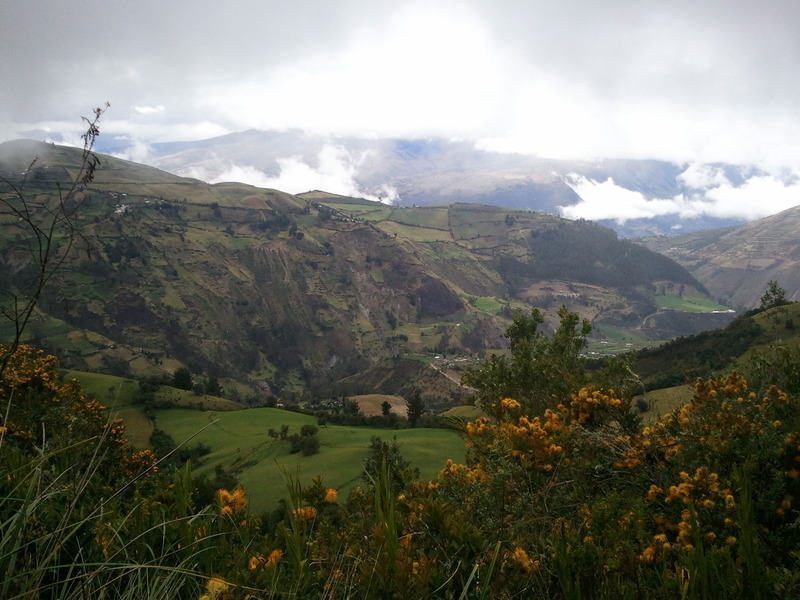 To get to Candelaria, we first had to take a bus from Quito to Riobamba then from Riobamba to Candelaria. I thought the bus rides were gruesome because they took a few hours, but the hike was even more treacherous! For any first time hikers out there, make sure you research the place you will be hiking beforehand. This tip was brought to you by Brenda, who didn’t pack enough warm clothes and underestimated how much it would rain and how cold it would be to sleep at a high altitude. 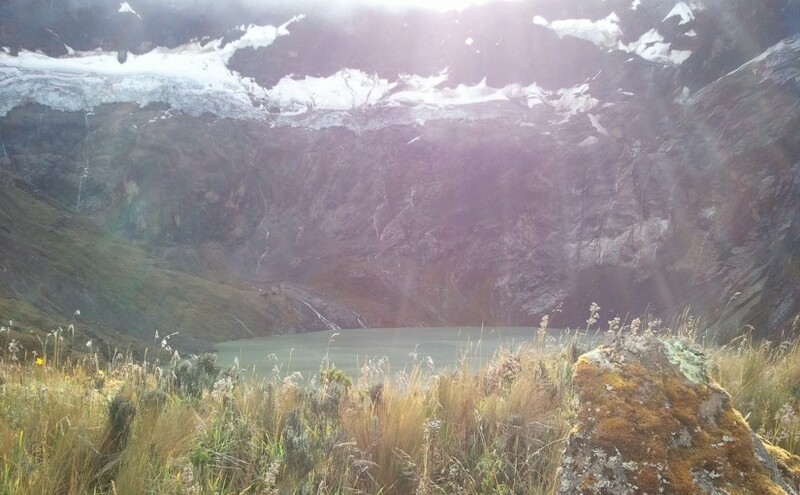 El Altar is beautiful with its glacier-covered mountains and mint-colored lakes. Its tranquil paths up to the camping place above the lake were only interrupted by the sound of birds, horses, dogs, and the occasional back-packer. I felt a little more at ease knowing that there were others out there venturing just like us. Since this was my first time hiking up mountains, my lungs and corazón were having a hard time keeping up. My legs didn’t even hurt, but my lungs were killing me as we went up the steep trails. I fell only a little behind, yet my friends would wait and encourage me even more. It felt really good being praised for my efforts; their words kept me going. After nine hours (from 8:30 AM till 5:30 PM), we made it to our camping site overlooking the lake. The rain and cold temperatures made sleeping difficult since I was up for most of the night trying to stay warm. When we woke up the next day however, the sun greeted us with its warmth. I decided to stay dry and not jump into the freezing lake, but I took pictures of my travel buddies as they did. It took us only about five hours to hike back down to the town of Candelaria, where we first witnessed some of the Ecuadorian Carnaval traditions. To really experience Carnaval, we figured we would travel to one of the best Carnaval towns in Ecuador: Guaranda. To begin, I must define a few key words regarding the festival and its celebrations. Carnaval – A religious festival that occurs before the Lent season. A big celebration is in Rio de Janiero, Brazil; Guaranda’s Carnaval is not as big, but it’s big in the sense that the whole town comes together to celebrate. And how do they celebrate? By spraying carioca all over each other. Carioca – White or colored foam in aerosol cans that is used to spray on random people on the streets. Foam wars will ensue. Young children will spray you in the eyes and you will most likely retaliate by spraying carioca all over their faces or the backs of their heads as they run away. This was probably the most fun part of the whole festival because my competitive side came out; if the Guarandans messed with one of my friends, they messed with us all. I got sprayed in the eyes a couple of times which only hurt because of the pressure of the foam and momentarily blinded me. I also did not like getting sprayed in the ears because the whole world became muted and I could only hear the sound of tiny foam bubbles bursting in my ear canals. Polvo – Powder. Powder that goes on your face/hair. This is often white powder but can also come in an assortment of colors such as red blue, yellow, and green. I was blue-faced for a while after I was attacked with polvo from a stranger. I couldn’t just let it happen… I had to do it too! I bought a small bag of polvo for 50 cents and smeared it on people’s faces all during the night. It was awesome!! Plus, the people who got powdered by me all cheered afterwards and gave me free stuff. They really enjoyed seeing my foreign group partake in all of the Carnaval traditions, so they just laughed and sprayed us with some more carioca. The night ended with some great Latin Pop music at a concert in the center of town. It rained and we were sore from the hiking, but with all of the positive vibes from Guaranda (and the awesome music) we ended up dancing all night long! This festival is one that I think everyone should go to at least once. Would recommend 10/10. I’ll say this was one of my best weekends in Ecuador so far! One tiresome hike followed by a huge, small-town party!! I’m excited for what other wonders Ecuador has in store for me, but until then: ¡cuídense, amigos! ¡Ciao!